In mid-February, we introduced you to the main points of the focus on sustainability at our production facility for uvex hearing protection in Sweden. High value is not just placed on sustainable manufacturing in Sweden. Safety footwear is also manufactured in accordance with our sustainability principles at the Ceva site, where the subsidiary UVEX CAGI S.R.L. is based. Minimum energy consumption. Maximum environmental protection. Over the past five years, energy consumption has been reduced by more than 12% through targeted measures. The introduction of a new lighting system has boosted our energy savings by an additional 24,000 kWh. As a result, 25% fewer lamps are needed and the lifespan of the energy saving lighting system has doubled, helping to reduce waste. We are saving as much energy as an average family uses in 10 years. We want to protect the environment and focus on effective measures for reducing our greenhouse gas emissions. reduce the annual CO2 output by 35,000 kg. With the additional energy gained from the solar power, we can manufacture almost 39,000 pairs of shoes per year. Minimum consumption. No waste water. We have been doing our utmost to reduce our water consumption to an absolute minimum. It only takes 0.06 litres of water to manufacture one pair of protective shoes – this value was verified through close-up images. The water used in the manufacturing process evaporates completely and as a result we do not produce a single drop of waste water. In addition we collect rainwater for use in our employee sanitary facilities. Through modern manufacturing technology and continuous optimisation of our production systems we were able to reduce our manufacturing waste by 25%. In addition, we are the first manufacturer in the protective footwear sector to collaborate with our technology partners on a comprehensive raw materials recycling concept. In future, a continuous recycling process will exist, creating new manufacturing materials out of raw material waste. Since 2012, 30 tonnes of plastic waste have been recycled and re-used in production each year. Shorter distances. Closer to the customer. Our manufacturing plant in Italy enables short delivery distances as 98% of our protective footwear customers are European. Material deliveries via Italian harbours reduce transportation distances throughout Europe. In 2009, uvex created a list of 51 banned pollutants in addition to to EC directives (e.g. REACH) in order to protect people and the environment. Independent testing institutes regularly test to verify the absence of these harmful substances. For example, only chromium(VI)-free bleached leather is used for our protective footwear. Industrial safety is very important to us: the number of workplace injuries is far below the industry average. All of our suppliers and business partners are bound to the uvex social standard. This guarantees adherence to ethical principles and basic human rights. Independent testing institutes inspect this at regular intervals. Furthermore, certification of ISO 14001 and ISO 9001 is emphasised in our choice of business partners. The majority of textile uppers and inner linings in our protective footwear conform to the Oeko-Tex® standard. The product packaging consists of more than 90% recycled material, only recylced paper, and is sourced from suppliers located within 50 km of the manufacturing plant. We are committed to children and young people: as a passive member of the CFP Cebano Monregalese School in Ceva, Italy, we contribute to creating job opportunities for young people. We also regularly participate in creating employment opportunities for disabled people. Furthermore, we are aware of our responsibility to our employees: 40% of them have been working for us for more than 20 years. Regular education and training opportunities are offered to our employees by the uvex academy. Those are our eight core principles on sustainability in Italy. Discover how our site in Sweden achieves sustainability manufacturing in our Sustainability brochure or read our blog item “Sustainable production at uvex”. Do you have any questions on sustainability or how it is implemented in our plants? Both SwedSafe AB in Höör, Sweden, and UVEX-CAGI S.R.L. in Ceva, Italy, are subsidiaries of the uvex safety group. The production facility for uvex hearing protection is located in Höör and our safety footwear is manufactured in Ceva. More than 1,700km apart, the two plants do not seem to have much in common aside from bearing the uvex name. However, there is one thing – or rather, one guiding principle, to which both plants firmly adhere: sustainability. As a family company, uvex thinks long-term. It also sets great store by sustainability. The uvex claim, “protecting people,” means that in addition to looking after those around us, uvex is also deeply committed to ensuring the well-being of the environment. The company therefore considers it imperative to act in a responsible way when dealing with resources and the environment during the manufacturing process. But what exactly is sustainability, and in what ways is it reflected in product manufacturing? Minimum energy consumption, maximum climate protection. Over the past eight years, the plant has managed to decrease its energy consumption by 45%. We keep energy demand at a very low level using modern machinery and innovative processes. Energy resources are used in an efficient way to help protect the climate. For example: just 3.6 kWh of energy are needed to manufacture 1,000 pairs of earplugs, which is no more than that required to produce the paper for your favourite weekly magazine. Innovative energy sources for a clean environment. Protecting the environment using renewable energy sources is one of uvex’s most important goals. We never use gas or oil for heating or in the manufacturing process. Most of the energy we use comes from wind and hydroelectric power, which means we produce no CO2 emissions. Of our electricity, 70% is produced in an ecological way. We would like to protect global water resources over the long term. We have therefore been doing out utmost over the years to reduce our water consumption to a minimum. The result: just 140ml of water is needed to manufacture 1,000 pairs of earplugs, which is equivalent to approximately one champagne glass. Cleaner method: any water used in the manufacturing process completely vaporises, which means not a single drop of waste water is produced. We recycle, which means that no hazardous waste is created. We have managed to significantly decrease our waste production in recent years. A mere 85 grams of waste are produced when manufacturing 1,000 pairs of earplugs. That’s the weight of one full coffee filter. Of our total waste volume, 75% is sent to the SYSAV incineration plant in Malmö, where it is converted into new energy. The rest is recycled, and no hazardous waste is produced. So, 75% of our waste is converted into new energy and 25% is recycled. Made in Sweden – think globally, act locally. Short transportation routes save valuable energy and reduce environmental pollution through harmful emissions. This is the reason 90% of our raw materials and packaging are sourced from local Swedish suppliers, principally within a 100km radius of the plant. Furthermore, the whole manufacturing process takes place in one location: Höör, Sweden. Made in Sweden: the stamp of protection and quality. Sweden has particularly strict regulations regarding health and environmental protection. Regular inspections ensure compliance with laws and regulations. uvex is therefore the first organisation in the personal protective equipment (PPE) sector to have been audited and approved in accordance with ISO 26000*. Optimal industrial safety is a matter of course for us. There have been no accidents at work for our employees since the company was established in 2005. This health and safety pledge also applies to our products: it’s been proven that our earplugs are free from harmful substances*. Protecting people’s health is guaranteed: we undergo regular inspections from independent testing institutes. Independent testing institutes regularly test to verify the absence of these harmful substances. Smart refill system. Easy disposal. 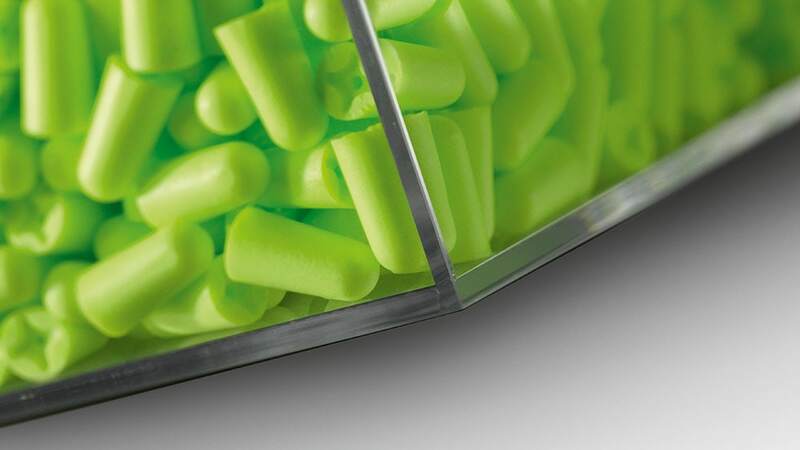 Of the earplugs we produce, 50% are sold in large, refillable dispensers. One dispenser is able to hold 400 pairs of earplugs and can be stocked with refill packs, decreasing the volume of waste. Our earplugs are for disposable hearing protection. As they can be incinerated without waste, they can be safely disposed of after use. Unlike reusable earplugs, ours do not need to be cleaned with water and aggressive cleaning agents. This helps conserve water resources, minimising the impact on the environment. With a refill quota of 50%, we save 85% on plastic film and 50% on cardboard boxes. More than 90% of our assembly work is carried out by people with disabilities. Our long-standing collaboration with sheltered workshops ensures the highest level of quality and gives individuals with disabilities a professional future. We help young unemployed people get their first job, and introduce them to the working world. The number of people we support per year is double that of our own employees. Those are our eight core principles on sustainability in Sweden. The core sustainability principles to which our Italian colleagues adhere can be found in the upcoming blog post “Sustainability in the security footwear manufacturing process” as part of our sustainability brochure.